profine GmbH extends its partnership as the main and shirt sponsor of the German football club 1. FSV Mainz 05. 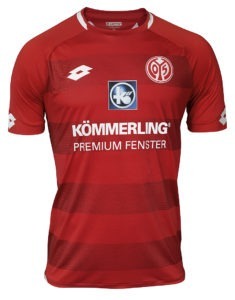 For another season, the Kömmerling brand will appear on the shirts of the Bundesliga team and will be prominently represented in the stadium and marketing of the “Zerofivers”. “Our cooperation with Mainz 05 has so far been extremely successful. This concerns both the increase in awareness of our Kömmerling brand and the positive response of our partners to this strategically important step towards consumer advertising”, says Dr. Peter Mrosik, owner and CEO of profine. Since the Bundesliga season 2014/15 the PVC-U profile manufacturer is partner of 1. FSV Mainz 05, since the season 2015/16 main and shirt sponsor. After the coming season, profine will switch to the second sponsorship level as an exclusive partner for another three years. In total, the new contract will run for four years. “Mainz 05 and our company share values such as team spirit, responsibility, passionate action and authenticity. Properties that we will continue to bring to the market for the success of our partners also in the future”, explains Dr. Peter Mrosik on the continuation of the partnership.